Net Entertainment has never stopped surprising all slot lovers and players. The latest that has added more weight to the spring of surprise from NetEnt is Starburst free pokie. This is one of the most incredible games you get to see in the casino world. We realised how valuable the pokie is and we have decided to write a thorough review so that you can get yourself acquainted to the essentials and the nitty-gritty of the game and thereafter play Starburst for real money without any much problem. Apart from the fact that you will get an awesome prize from playing this pokie, another incredible attribute it has is that you can enjoy yourself and have as you play it. The review that you are about to read will give you everything you need to get started with the game, therefore, read further. 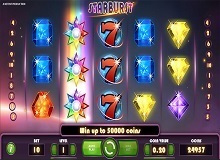 Starburst Casino slot online has 5 reels and 10 paylines. The least number of coins you will see in a line is 1 while the highest number of coins you will have in a line is 10. The least amount of bet that you can put into this game per payline and per spin is 0.01 credit. On the other hand, the highest amount of bet that you place on the pokie per payline is 10 credits, but per spin, it is 100 credits. The principle of betting and returns in this game is not in any way different from most other slots that you have seen before. The relationship between them, that is, the betting amount and the payout, is directly proportional. The higher your betting amount, the higher your prize and the lower your betting amount, the lower your prize. The pokie has a jackpot of a whopping 50000x. Don’t be surprised, that’s exactly what you will get if you coordinate your gameplay very well. Aside from this, another thing is that this game promises to be a rewarding one because the return to player (RTP) is 96.1% and this means that your chance of getting a payout is very high. 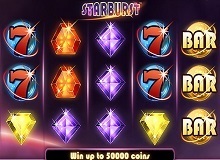 As you embark on your journey to play Starburst slot machine online, you will come in touch with several symbols. There are some of these icons that are very important and highly valuable. They include the jewels that come in different colours like purple, orange, blue, yellow, and green. The other icons you will see are the bar and seven icons. 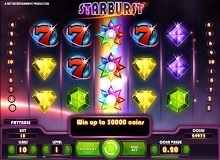 In Starburst slot, the wild icon is denoted by the Starburst itself, and it possesses the power that most wild icons in other casino pokies have. You surely will like to utilise it as you forge ahead in your bid to winning great prizes. First things first! Here, the first thing you need to do is to select the number of the active paylines that you want using the Line button. The next thing is to select your bet level. After this, you can make a decision on the coins size you want and use the coin value to set same. You can use the Max Bet button to set the highest value of bet possible in the game, this will then mean that you have the opportunity to win the highest amount of money possible. If you click the Spin button, it means you are ready to start playing the pokie immediately. You have to utilise the bonus features in this game so that you can win your desired cash. The Starburst wild icons show up on reels two, three, and four. If you get at least one wild icon to show up on any of these reels, you have successfully triggered the Starburst wild feature. You will then see the expansion of the wilds to cover the whole reel they are occupying and also ensure that other reels undergo a re-spin round. 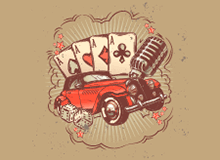 This means that the wild icon is the most important of this pokie as it gives you exactly what you want, money! You have read this review, and you have seen for yourself that this game gives you the prospect to command great winnings and make yourself happy. With a return to player (RTP) of 96.1% and a jackpot of 50000x, you need to lay your hands on it.